lisa is cooking: David Lebovitz, What Are You Reading? David Lebovitz, What Are You Reading? After working as a pastry chef at several restaurants in San Francisco, including almost thirteen years at Chez Panisse, David Lebovitz now lives in Paris where he leads culinary tours and writes books that we all know and love. A couple of the latest of those books are The Perfect Scoop , which is a favorite of mine, and The Sweet Life in Paris , which is a great read with great recipes like dulce de leche brownies. His brand new book is Ready for Dessert , and this one brings together the best of his desserts with new photos and additional recipes. On David’s blog, there’s always something entertaining, delicious, or informative and probably a combination of all three. I had to ask him, what are you reading? 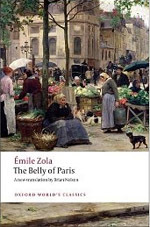 Right now I'm reading The Belly of Paris , a new translation, and what I'm particularly enjoying about it is that it brings the city of Paris from a whole different era back to life. The giant market, Les Halles, must've been amazing and the descriptions of the piles of food and the people who worked there are so vivid and make me a bit sad that the market was torn down in the name of "progress." 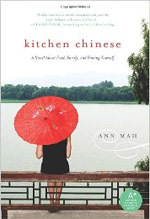 I recently read Kitchen Chinese , by Ann Mah, a novel about a young woman moving back to China and rediscovering her identity by becoming a food writer. 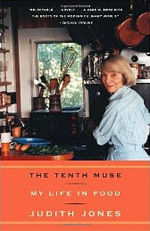 I also enjoyed The Tenth Muse by Judith Jones. A lot of people don't realize how important she's been to modern cooking; she discovered and was responsible for getting everyone from Julia Child to Marcella Hazan published. She lived in Paris, too, which made the book a nice reminiscence of a time when French cooking was still loaded with cream-soaked gratins and bustling bistros. Am looking forward to baking my way through Farmers' Market Desserts , by Jennie Schacht. It's filled with things like cobblers and pies, using all those wonderful fruits that are starting to appear at my market this month. 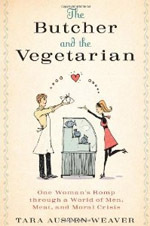 On deck, is The Butcher and the Vegetarian by Tara Austen Weaver. Am looking forward to diving into her story about her conversion from vegetarian to meat eater. She's a great writer and when I pull myself out of the kitchen, I'm devouring this book next. Thank you for participating, David! Check back to see who answers the question next time and what other books are recommended. More great titles to read! I'm particularly intrigued by Kitchen Chinese and The Butcher and The Vegetarian. This series is a wonderful way to learn what catches the interest of some of our favorite food writers and chefs. Thanks Lisa and David! I am always intrigued by what food writers are reading and David has given me a list to look into. Thanks Lisa! Adding these to my lists! Great reads! The Kitchen Chinese sounds interesting! A nice collection of books! That Faermers' Market Desserts sounds great! I want to read the Kitchen Chinese book! wow this is another great collection of books, wuish i have them on my bookshelf! I really love these posts, Lisa. Going to look into a couple of the books David is reading. Excited to discover a few of these lovely reads. Thanks again! This was fun to read. I made his chocolate macaron recipe yesterday. So many books, so little time! "Kitchen Chinese'' is also on my stack to read. Now, I just need to carve out a day to crack it open finally. Great lists Lisa. I probably ask my son to buy "The belly Of Paris" for mother's day gift. wow the butcher to vegetarian is really the other side of the coin that ppl hardly write about - thank u for this post .. I'll probably try to get my hands on a copy ASAP! Lisa - You're not making the stack of books on my nightstand any smaller. What a great list of reads. I'll join the chorus and say that the Kitchen Chinese sounds very interesting. The Belly of Paris also sounds wonderfully informative. Ooo, see now I didn't even know that there was a new book out from David! Gotta get it!